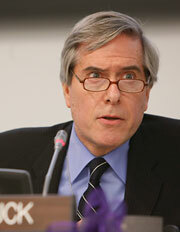 Edward C. Luck, Ph.D., served as the United Nations’ first Special Adviser on the Responsibility to Protect, at the Assistant Secretary-General level, from 2008 to 2012. He was responsible for the conceptual, political, and operational/institutional development of the principle and was the architect of the Secretary-General’s three-pillar strategy for implementing the Responsibility to Protect, as well as the primary author of his first four reports on the subject from 2009 through 2012. A prolific author, Dr. Luck has published books on the UN Security Council, on compliance with international law, on American exceptionalism, on conventional arms control, and on the endings of war. He has taught at Columbia, Princeton, and Sciences-Po and headed research centers at Columbia and jointly at the Woodrow Wilson School and the New York University School of Law. He has also served as President and CEO of the United Nations Association of the USA and as Senior Vice President of the International Peace Institute. I’ve been impressed both by what the Auschwitz Institute stands for and by what it does. Its training programs for younger diplomats and opinion leaders are essential to keeping the memory and lessons of Auschwitz alive for policymakers around the world. AIPR’s efforts to build an inter-governmental network across Latin America to prevent genocide and other atrocity crimes are both promising and timely. We all need to be reminded that it could happen here and that it takes concerted and collaborative work to avoid repeating the mistakes of the past.